The Grand Canyon That's a big ole hole! 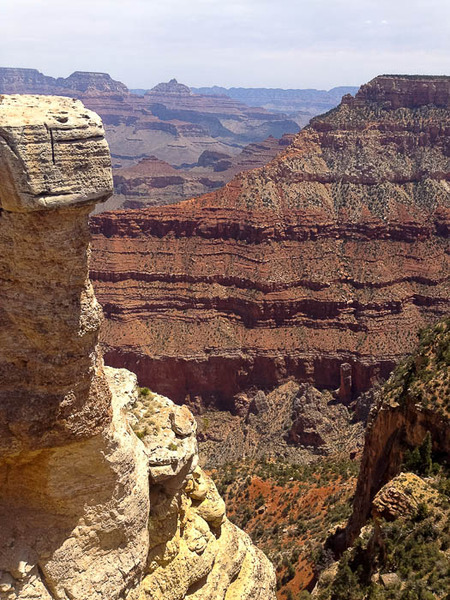 Oh man, what do you say about the Grand Canyon? It's such a quintessentially American landmark, famously known world-wide, a staple of many a great American road trip. I mean, it's not called the Grand Canyon for nothing. 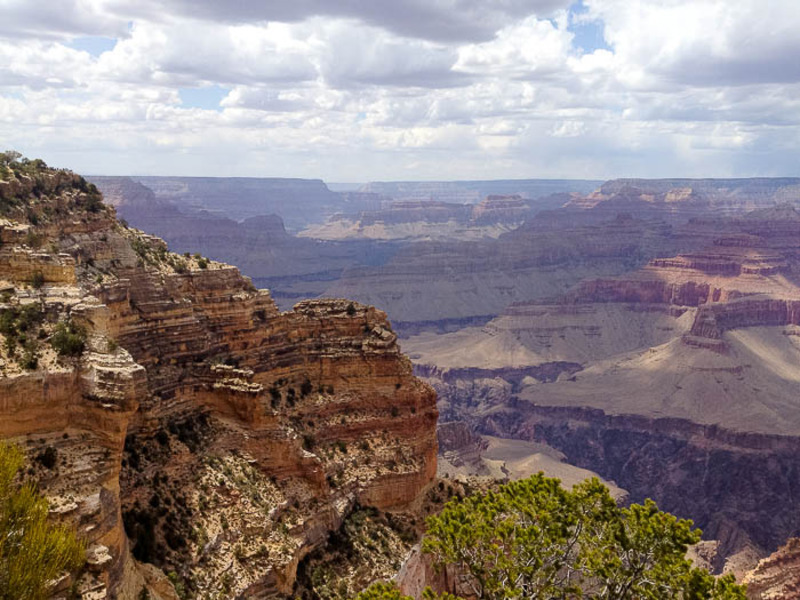 After a long drive from eastern Utah, through Monument Valley, and across the featureless desert of northern Arizona, we entered Grand Canyon National Park. 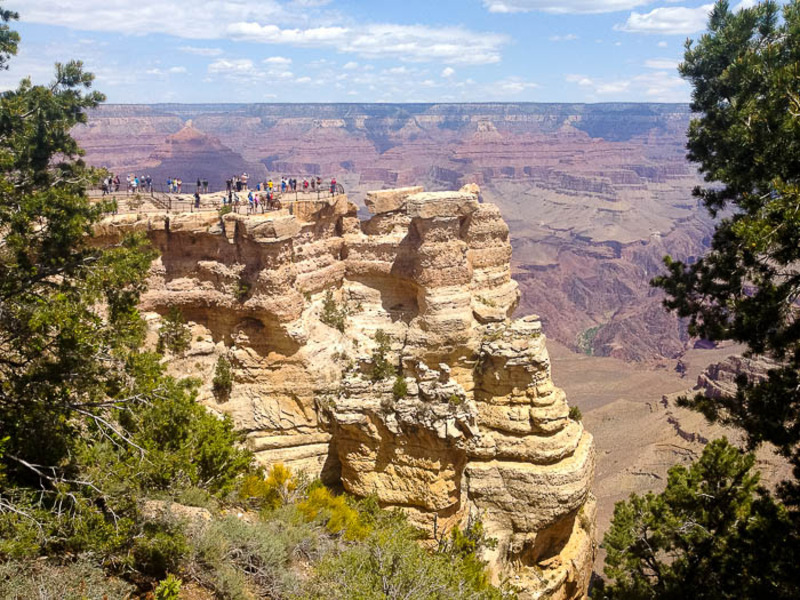 We were surprised at the change in vegetation upon entering the park; the South Rim of the Canyon is surrounded by Kaibab National Forest, which is lush with ponderosa pines, Douglas firs and spruce trees. 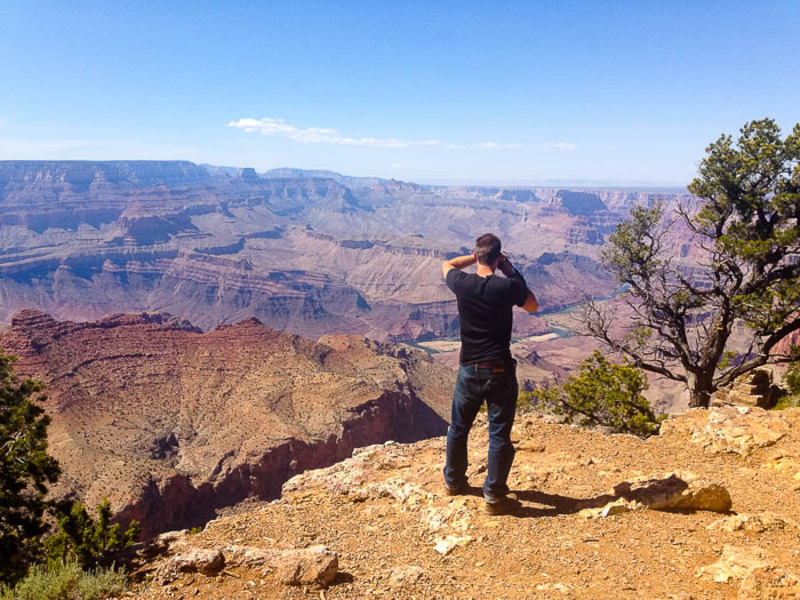 We made a beeline to the nearest overlook to get our very first glimpse of the Grand Canyon. We parked B.B. and Loretta and walked through the throngs of international tourists to the edge of the canyon. What we saw could have easily been a painted backdrop, the kind that Wile E. Coyote would have slyly placed in front of a brick wall in hopes of Road Runner smashing into it. The Grand Canyon, one mile deep and ten miles across, is so immensely large and vast that my brain couldn't quite comprehend what I was seeing. 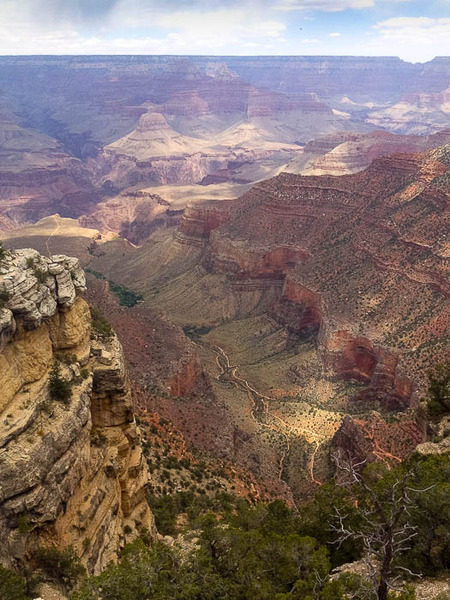 The light and atmospheric haze that fell upon the canyon obscured all sense of distance or scale. The millions of ridges, buttes and mesas within the canyon created a topographic display of multi-tonal mountains carved away over six million years by the Colorado River, now a thin turquoise vein running through the canyon's center. 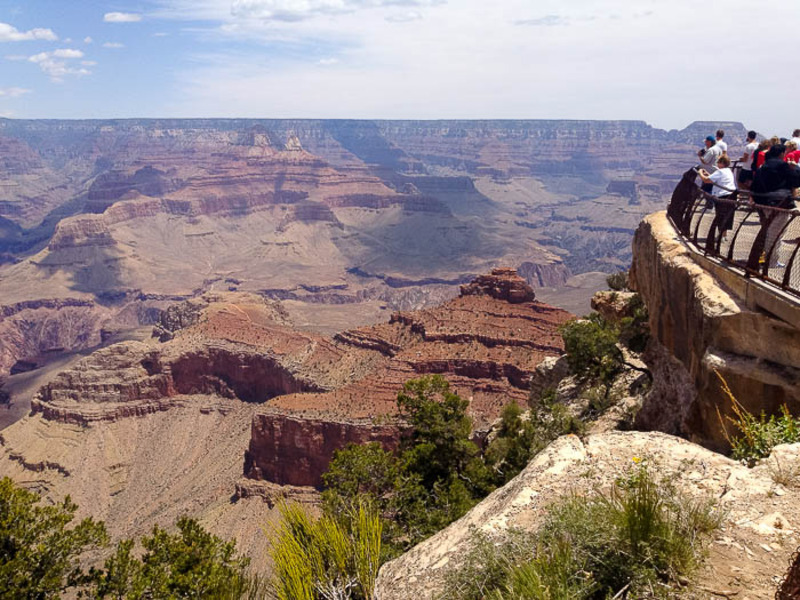 No photograph or description could have prepared me for the overwhelming feeling of smallness and awe I felt standing in front of the Grand Canyon. We decided to set up camp in Kaibab National Forest, south of Tusayan, the closest town to the Grand Canyon's South Rim. After our successful boondocking experience with the Watson's in Colorado, we were confident in our off-the-grid camping skills. Two hours later and nearly getting stuck in one heavily forested campsite, we finally settled into a secluded, easy-in-easy-out site that was perfect. The next day we met up with Dennis and Jeanette, fellow full-time travelers whose blog we had caught wind of a few months back. They've been on the road for nearly five years (!! ), have a sweet 1978 Wanderlodge bus and call themselves Cheddar Yeti. We met them late morning at the trailhead that starts at the western end of Grand Canyon Village, where we set off on a hike along the South Rim's paved trail. Our hike ended up much longer than we planned because the four of us were so wrapped up in conversation; we talked about everything from living and working on the road to underestimating the kindness of a bro. It was too easy to forget that we were walking along the edge of the Grand Canyon. Special thanks to karenarms (who suggested See the Grand Canyon), Olivia D. (who suggested The GRAND CANYON), and Cindy T. (who suggested Bike, hike, take lots of pictures!) for making this blog post possible!